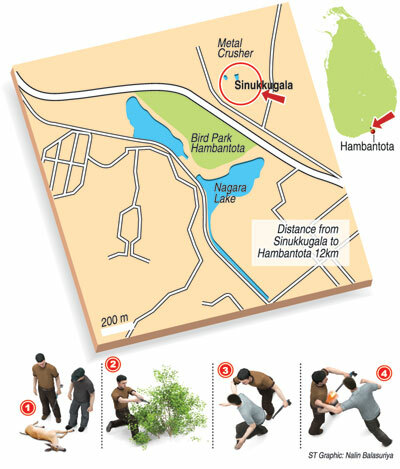 Six Wildlife Department officers, two armed with rifles, waited in ambush for more than two hours in the Sinukkugala jungles 16km from Hambantota town. Their mission was to arrest poachers poisoning wild animals to sell their flesh. 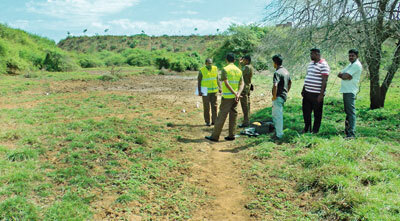 Leading the party, the Officer-in-Charge (OIC) of the Hambantota Wildlife Range, Ajith Gunatunga, waited patiently in the scrub close to a pond to which poison had been introduced by the poachers; nearby lay a deer that had died after drinking the water. The officers had received information that this waterhole had been poisoned. Shortly before dawn, two men approached the carcass of the deer. One of them waited at a distance near his motorcycle while the other approached the dead deer. As he tried to carry the carcass away the officers pounced. “One officer grabbed one of the hunters while the other fled and some of us gave chase. The officer’s struggle with the captured hunter intensified but the hunter escaped his grip,” Mr. Gunatunga said. The injured officer was rushed to Hambantota Hospital but was pronounced dead on admission. 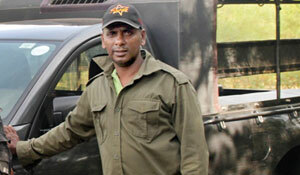 Ranger Seneviratne, 43, was a father of two and had taken part in several raids. The suspect was eventually apprehended and produced in court and remanded until July 20. The other man escaped. The team of wildlife officers mourned not only the loss of another officer but also a close friend. “The loss of our comrade is a loss for us. We will help his family and continue our fight against poachers,” OIC Gunatunga said, adding that the department had put on extra patrols after receiving information about poachers. The OIC revealed that poaching in Hambantota during the Kataragama Perahera season had increased as poachers were providing wild meat for perahera visitors as well as ordinary tourists. Small deer species, wild boar, porcupines, birds and even bats and squirrel fell victim to the poachers, who used nooses, traps and trap guns to kill the animals. Even other animals that are inedible end up maimed and dead due to these hunting methods, the OIC said. “This time they were using agricultural chemicals in water to kill animals and we had to take urgent action to prevent further animal deaths,” Mr, Gunatunga said. The police said the poacher would be charged under the Wildlife Conservation Act. The President of the All-Island Wildlife Association, Chaminda Priyalal Attanayake, said the weapons given to wildlife rangers were too bulky for use in such raids. The officers use shotguns, repeater rifles that need to be manually loaded. “Poachers have better guns, better camouflage and political backing from various ministers and even from religious leaders who want to encroach on jungle land,” he said. He said the rangers need a camouflage uniform and automatic pistols. The incident comes in the wake of the increase in poaching in wildlife parks and forest reserves. Among the detections this week, a local politician from Wennappuwa who was transporting a slaughtered sambar deer was arrested in Nuwara Eliya and remanded (see side story on this page). Supun Lahiru Prakash, environmentalist and researcher at the Biodiversity Conservation and Research Circle of Sri Lanka, said wildlife officers should be able to draw on assistance from the armed forces and police. ‘The wildlife officers should be empowered to carry out raids even on eateries where they sell animal flesh and even places where they store carcasses,” he said. “Whenever people are allowed to travel through forest or wildlife reserves or parks during religious festivals the government should also be able to deploy officers to ensure that the wild animals are protected,” Mr. Prakash said. Sajeewa Chamikara of the Environmental Conservation Trust said poaching was taking place in Yala, the Knuckles Range, Panwila, Sinharaja, Wasgamuwa and Hambantota wildlife parks and forest reserves. He said that due to poaching some endemic animals have been wiped out in areas which also disturbed the food chain eco-system. Mr. Chamikara said wildlife officers needed more training in use of weapons and combating poachers. He said currently the Department lacked a Director-General and this adversely affected its work. Environmental lawyer Jagath Gunawardena said the killing of any animal with poison was illegal according to the Flora and Fauna Protection Act while culling fish using poison was also outlawed by the Fisheries and Aquatic Resources Act and culprits could be fined as well as imprisoned. Don’t eat poisoned jungle meat Eating the flesh of poisoned wild animals can be dangerous, the Colombo Municipal Council’s chief veterinary surgeon, Dr. Vipula Dharmawardena warned.He pointed out that in the meat industry animals were never slaughtered with poison because poison given to the animal could be transferred to the consumer. In slaughterhouses, animals were checked by a vet before and after they are killed. “Usually wild animals are killed in a hurry by unconventional methods as the slaughter is illegal, and usually hidden in the jungle until the killers find a means of transport,” Dr. Dharmawardena said. “Because of these conditions the meat can be poisonous, rotten, eaten by other animals, infected with maggots and contain unknown bacteria,” he said. “The transport of this meat is carried out without using freezers – the animal is just skinned and the meat is even wrapped in the same skin. This meat can make people seriously ill,” he warned. Brave ranger’s family calls for justice The family of the Department of Wildlife officer killed during a raid on poachers this week called for stern action to control poaching.“The government should to take serious action against poachers who kill animals. Otherwise people like my son who protect the rights animals, would meet with such tragic incidents,” Giyagunage Wijeratne, father-in-law of the dead ranger, Jagath Seneviratne, said. He called on the government to take care of his daughter and two children, who are eight and four years old. Mr. Wijeratne said his daughter, 40-year-old Madurangi Pushpa, a teacher of Konkarahena School, did not earn enough to provide enough for her boys, Dananjaya and Dinedya. 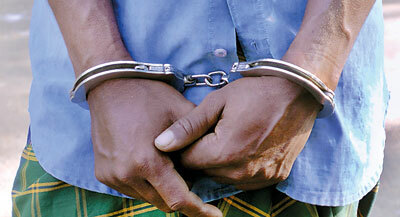 The widowed Mrs. Seneviratne said her husband was a brave officer who regularly took part in such raids. “He sacrificed his life while trying to protect animals. The authorities should take stern action against those involved in poaching,” she said. The Director of Operations at the Department of Wildlife Conservation, S. Pathiratna, said the department would take care of the dead ranger’s funeral.